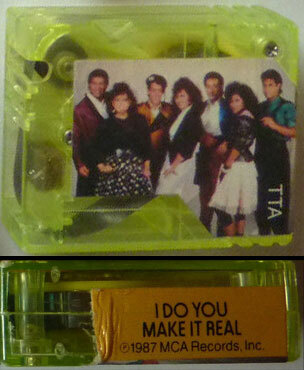 The back of each tape is marked "Pocket Rockers ©'87 F-P, MADE IN HONG KONG". 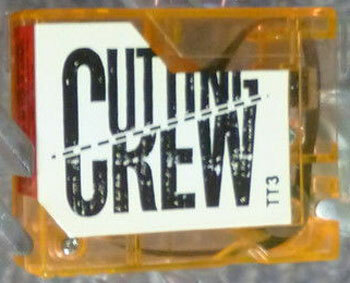 Each tape measures 1-1/4" wide, 1-1/2" tall, 3/8" deep. 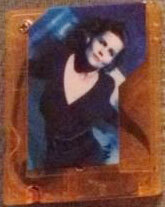 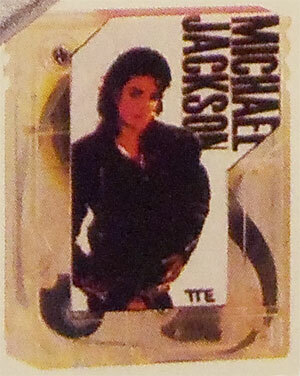 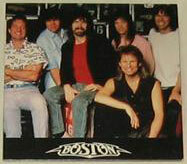 Each tape was sold with a belt clip and with a 2-3/4" square Music Card. 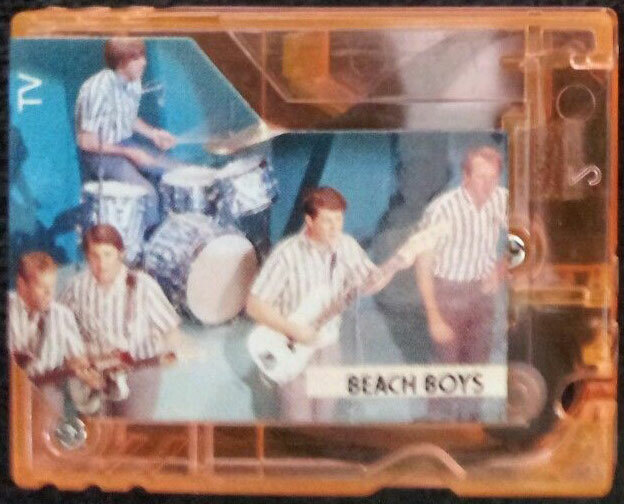 The inside of each Music card has two Rock 'n Roll trivia questions and answers. 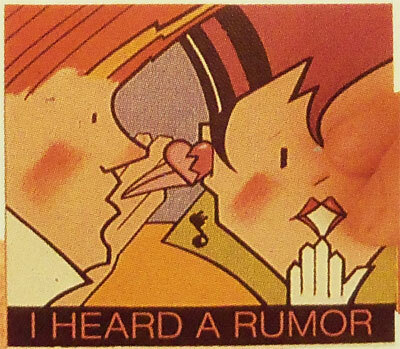 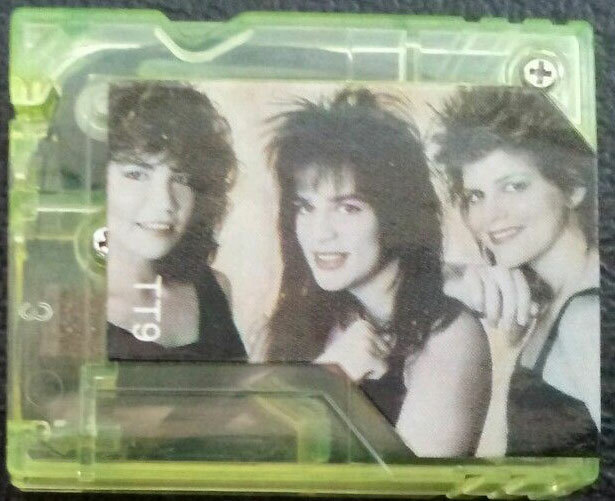 Title: Bananarama - "I Heard A Rumour"
Description: Pocket Rockers Mini-Cassette with a paper lithograph and the song titles "I Heard A Rumour" and an unknown song by Bananarama on the top. 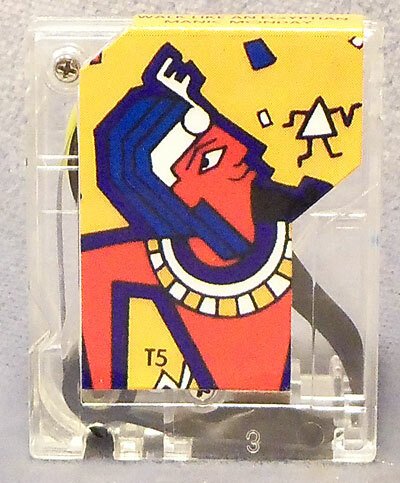 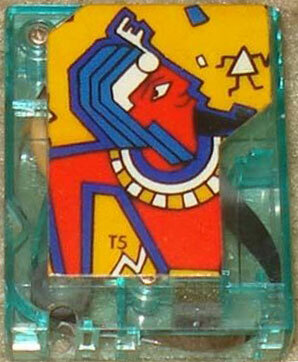 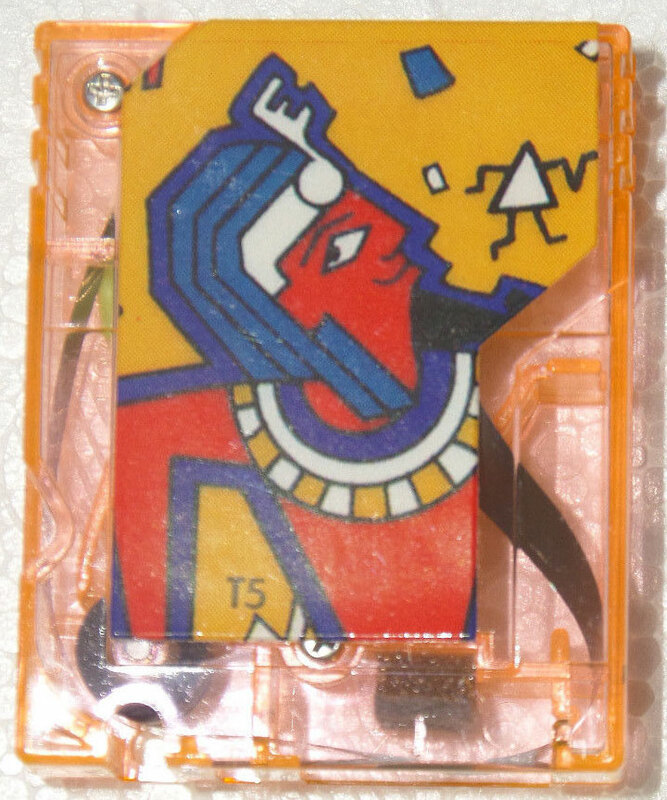 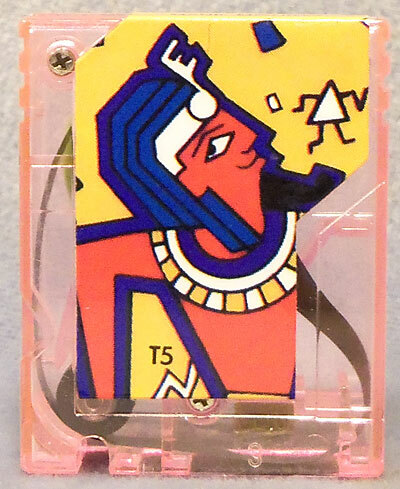 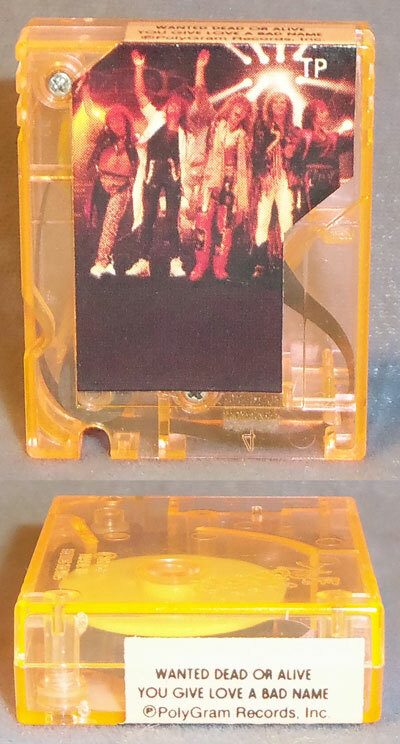 Title: The Bangles - "Walk Like An Egyptian" & "Manic Monday"
Description: Pocket Rockers Mini-Cassette with a paper lithograph that has a picture of a red Egyptian with orange background on the front and the song titles "Walk Like An Egyptian" and "Manic Monday" by The Bangles on the top. 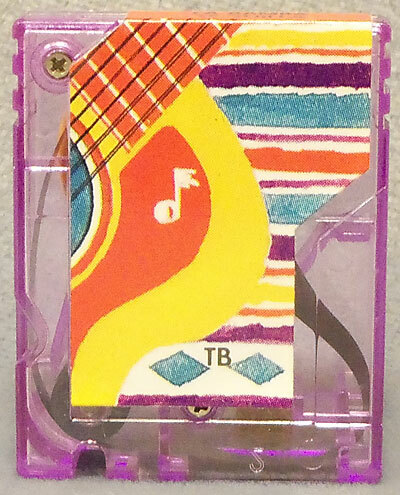 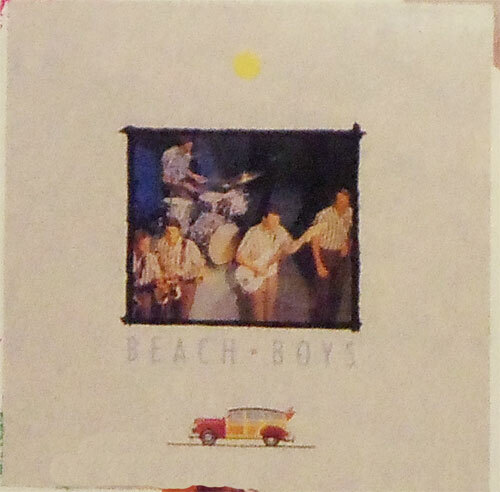 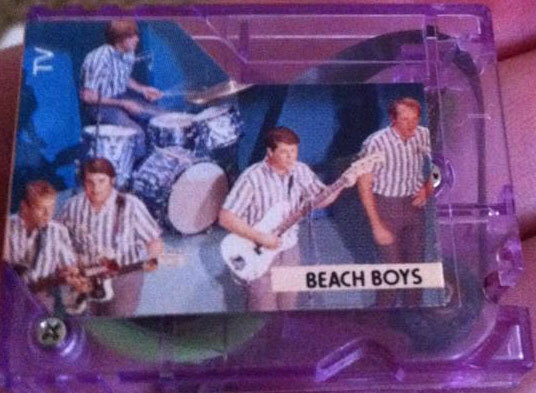 Title: The Beach Boys - "Surfin' Safari" & "Surfin' USA"
Description: Pocket Rockers Mini-Cassette with a paper lithograph on the front of the Beach Boys (five male artists) and marked "SURFIN' SAFARI" and "SURFIN' USA" on the top. 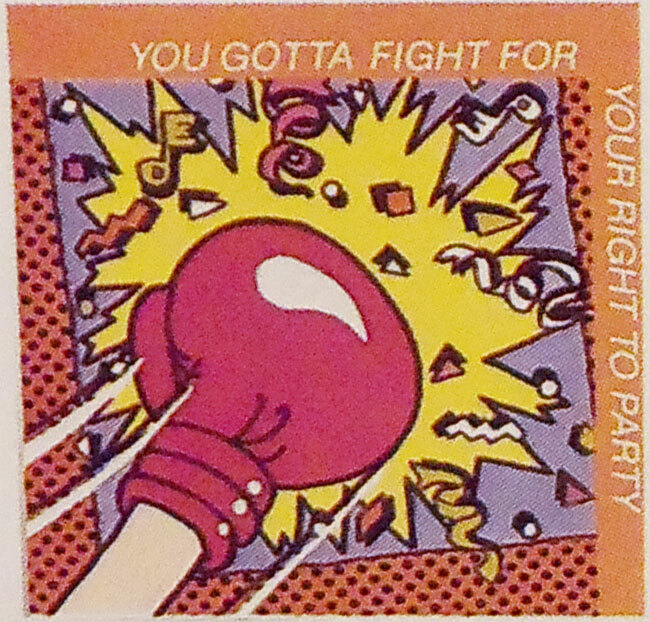 Title: Beastie Boys - "You Gotta Fight For Your Right To Party"
Description: Pocket Rockers Mini-Cassette with a paper lithograph and the song title "You Gotta Fight For Your Right To Party" and an unknown song by Beastie Boys on the top. 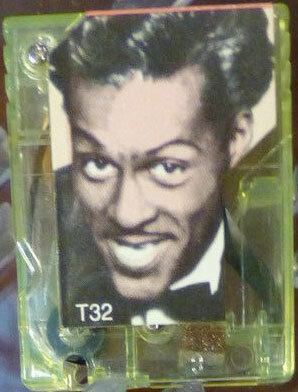 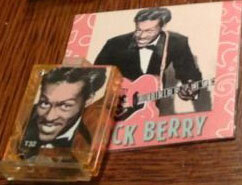 Title: Chuck Berry - "Johnny B. Goode" and "Rock and Roll Music"
Description: Pocket Rockers Mini-Cassette with a paper lithograph that has a picture of Chuck Berry on the front and the song titles "Johnny B. Goode" and "Rock and Roll Music" on the top. 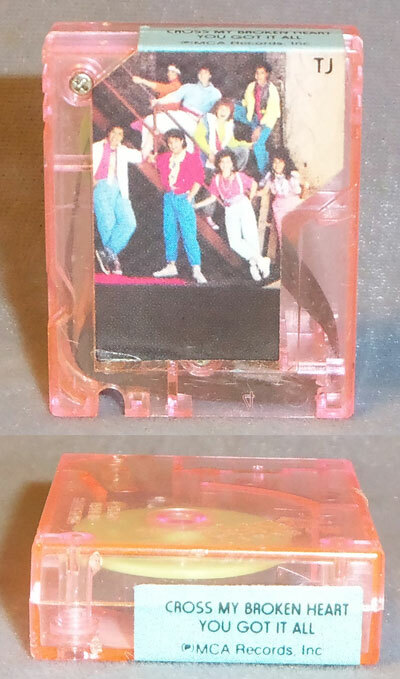 Title: Bon Jovi - "Living on a Prayer" & "Runaway"
Description: Pocket Rockers Mini-Cassette with a paper lithograph of Bon Jovi's Slippery When Web album cover and song titles "Living on a Prayer" and "Runaway" on the top. 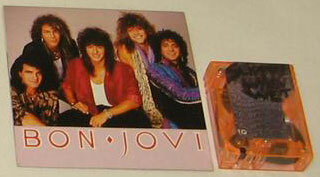 Title: Bon Jovi - "Wanted Dead Or Alive" & "You Give Love A Bad Name"
Description: Pocket Rockers Mini-Cassette with a paper lithograph that has a picture of Bon Jovi (5 male artists with an arm up in the air) and the song titles "Wanted Dead Or Alive" and "You Give Love A Bad Name" on the top. 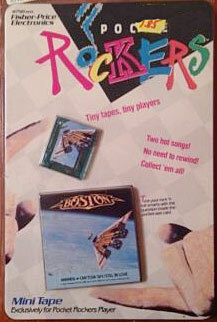 Title: Boston - "Amanda" and "Can'tcha Say/Still In Love"
Description: Pocket Rockers Mini-Cassette with a paper lithograph that has a picture of a guiter spaceship and the song titles "Amanda" and "Can'tcha Say/Still In Love" by Boston on the top. 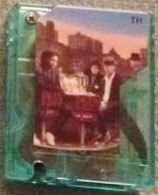 Title: Breakfast Club - "Right On Track" and "Kiss & Tell"
Description: Pocket Rockers Mini-Cassette with a paper lithograph of 4 band members sitting at a diner with cityscape in background. 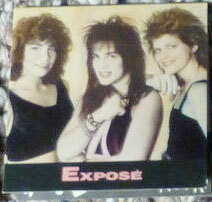 Song titles "Right On Track" and "Kiss & Tell" by Breakfast Club on the top edge of cassett. 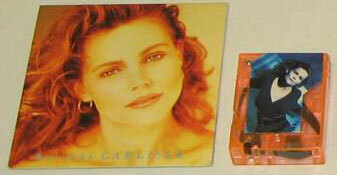 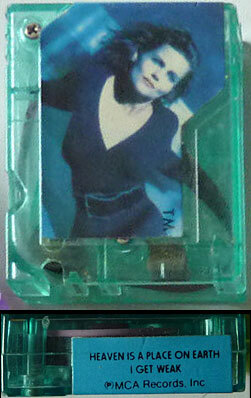 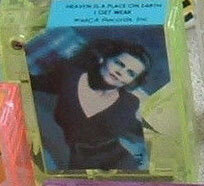 Title: Belinda Carlisle - "Heaven Is A Place On Earth" and "I Get Weak"
Description: Pocket Rockers Mini-Cassette with a paper lithograph that has a picture of Belinda Carlisle on the front and the song titles "Heaven is a Place on Earth" and "I Get Weak" on the top. 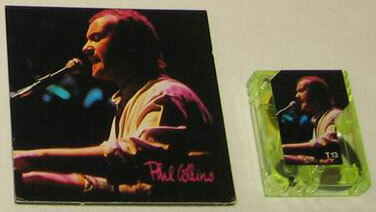 Title: Phil Collins - "Sussudio" and "Don't Loose My Number"
Description: Pocket Rockers Mini-Cassette with a paper lithograph of Phil Collins playing a piano and singing into a microphone and the song titles "Sussudio" and "Don't Loose My Number" on the top. 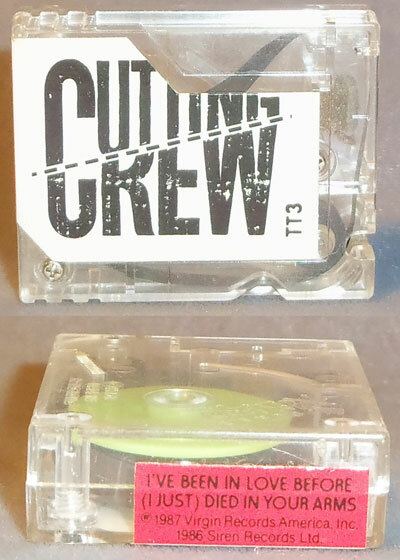 Title: Cutting Crew - "I Just Died In Your Arms Tonight" and "I've Been In Love Before"
Description: Pocket Rockers Mini-Cassette with a paper lithograph marked "CREW" in black and the song titles "I Just Died In Your Arms Tonight" and "I've Been In Love Before" by Cutting Crew on the top. 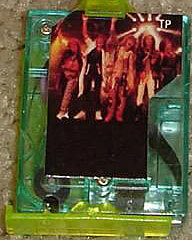 Title: Danny and the Juniors - "At the Hop" & "Rock and Roll is Here to Stay"
Description: Pocket Rockers Mini-Cassette with a paper lithograph and the song titles "At the Hop" and "Rock and Roll is Here to Stay" on the top. 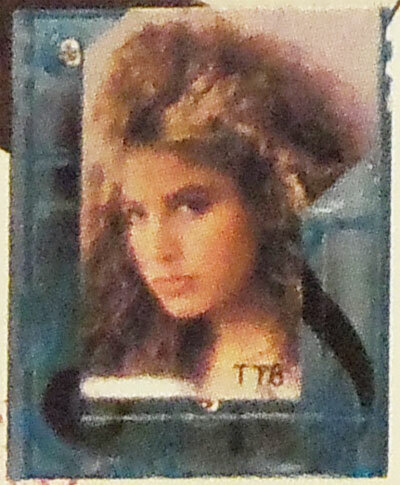 Title: Taylor Dayne - "Tell It To My Heart" and "Prove Your Love"
Description: Pocket Rockers Mini-Cassette with a paper lithograph that has a picture of Taylor Dayne's face and the song titles "Tell It To My Heart" and "Prove Your Love". 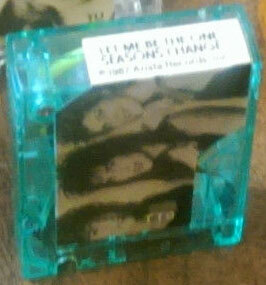 Title: Expose - "Let Me Be The One" and "Seasons Change"
Description: Pocket Rockers Mini-Cassette with a paper lithograph that has a picture of Exposé (3 female artists) and the song titles "Let Me Be The One" and "Seasons Change". 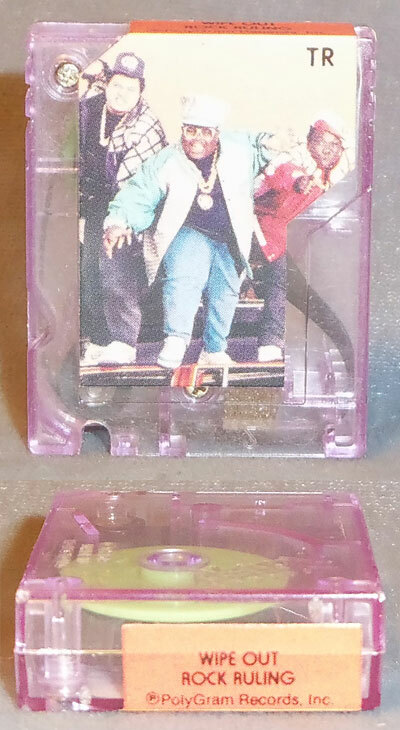 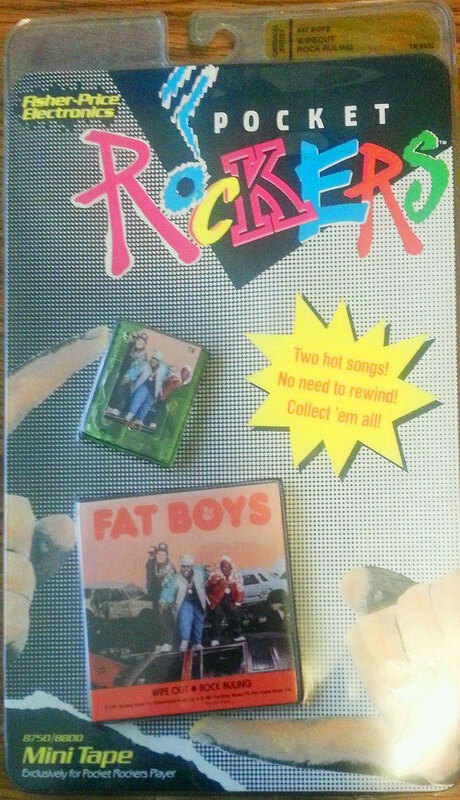 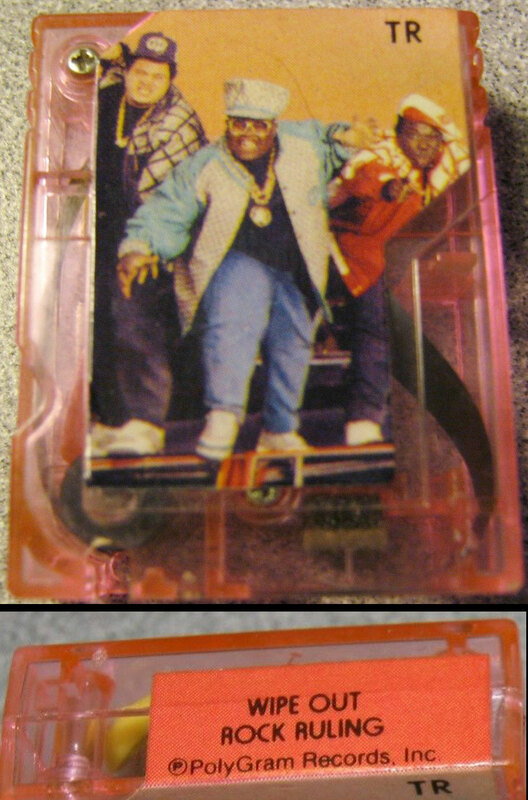 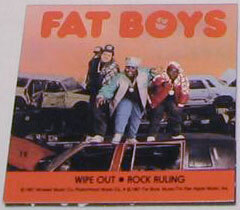 Title: The Fat Boys - "Wipe Out" & "Rock Ruling"
Description: Pocket Rockers Mini-Cassette with a paper lithograph that has a picture of The Fat Boys (three male artists) on the front and the song titles "Wipe Out" and "Rock Ruling" on the top. 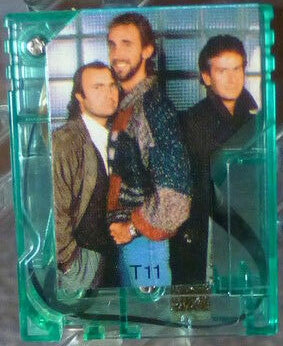 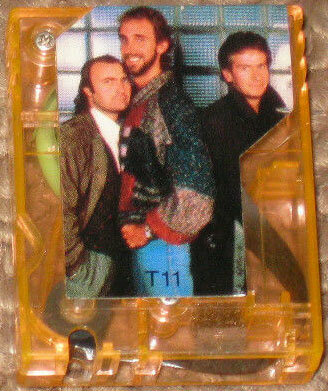 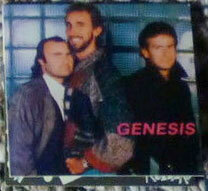 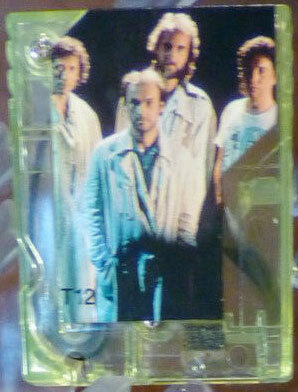 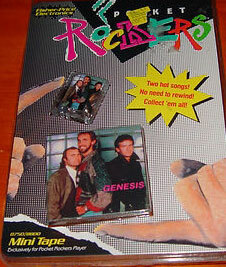 Title: Genesis - "Invisible Touch" and "The Last Domino"
Description: Pocket Rockers Mini-Cassette with a paper lithograph that has a picture of Genesis Band (3 members, including Phil Collins) and the song titles "Invisible Touch" and "The Last Domino" by Genesis on the top. 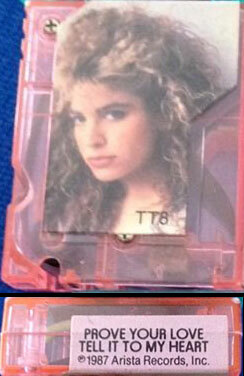 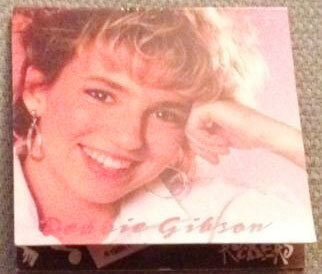 Title: Debbie Gibson - "Shake Your Love" and "Only In My Dreams"
Description: Pocket Rockers Mini-Cassette with a paper lithograph that has a picture of Debbie Gibson (face only) on the front and the song titles "Shake Your Love" and "Only In My Dreams" on the top. 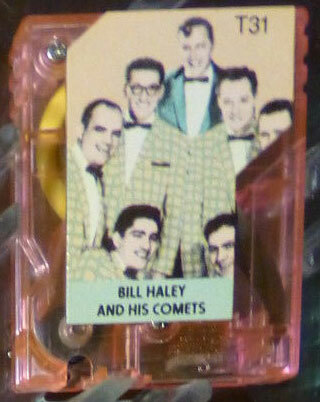 Title: Bill Haley and his Comets "(We're Gonna) Rock Around the Clock" and "Shake Rattle & Roll"
Description: Pocket Rockers Mini-Cassette with a paper lithograph that has a picture of Bill Haley and his Comets band (7 male artists) on the front and the song titles "(We're Gonna) Rock Around the Clock" and "Shake Rattle & Roll" on the top. 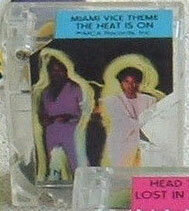 Title: Jan Hammer - "Miami Vice Theme" and Glenn Frey - "The Heat is On"
Description: Pocket Rockers Mini-Cassette with a paper lithograph that has a picture of the two cops from the TV series Miami Vice on the front and the song titles "Miami Vice Theme" and "The Heat is On" on the top. 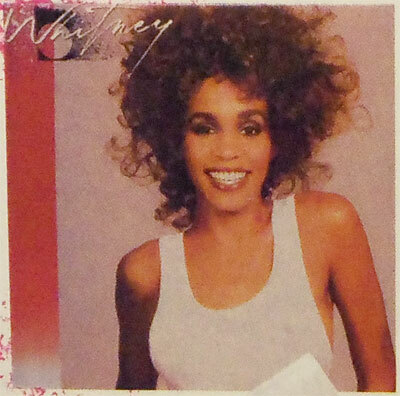 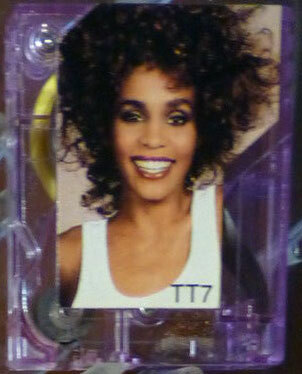 Title: Whitney Houston - "How Will I Know" and "Greatest Love Of All"
Description: Pocket Rockers Mini-Cassette with a paper lithograph that has a picture of Whitney Houston on the front and the song titles "How Will I Know" and "Greatest Love Of All" on the top. 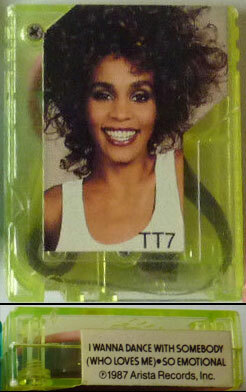 Title: Whitney Houston - "I Wanna Dance with Somebody (Who Loves Me)" and "So Emotional"
Description: Pocket Rockers Mini-Cassette with a paper lithograph that has a picture of Whitney Houston on the front (wearing white tank top) and the song titles "I Wanna Dance with Somebody (Who Loves Me)" and "So Emotional" on the top. 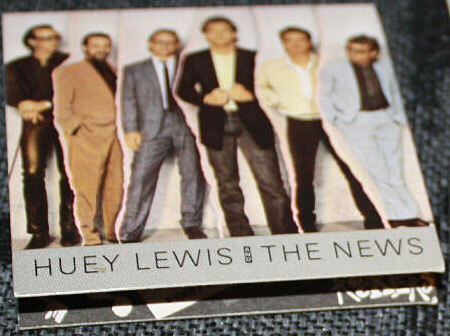 Title: Huey Lewis And The News - "Doing It All For My Baby" & "The Power of Love"
Description: Pocket Rockers Mini-Cassette with a paper lithograph that has a black cartoon dog face (dog wearing sunglasses with a female dog in one lense) the song titles "Doing It All For My Baby" and "The Power of Love". 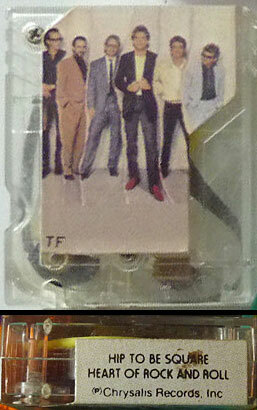 Title: Huey Lewis And The News - "Hip To Be Square" & "Heart of Rock and Roll"
Description: Pocket Rockers Mini-Cassette with a paper lithograph that has a picture of Huey Lewis And The News on the front (six male artists) and the song titles "Hip to Be Square" and "Heart of Rock and Roll" on the top. 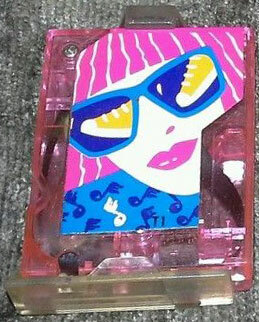 Title: Lisa Lisa & Cult Jam - "Head to Toe" & "Lost in Emotion"
Description: Pocket Rockers Mini-Cassette with a paper lithograph that has a picture of a cartoon girl with pink hair and blue sunglasses. 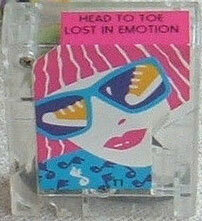 Has song titles "Head to Toe" and "Lost in Emotion" on the top. 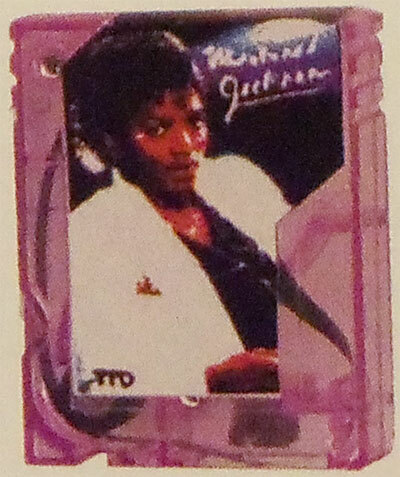 Title: Michael Jackson - "Wanna Be Startin' Somthin'" & "Another Part Of Me"
Description: Pocket Rockers Mini-Cassette with a paper lithograph that has a picture of Michael Jackson wearing a white suit. 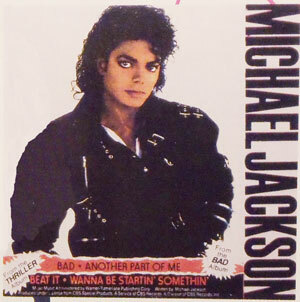 The litho has the words "MICHAEL JACKSON" in white script on the front and the song titles "Wanna Be Startin' Somthin'" & "Another Part Of Me" on the top. 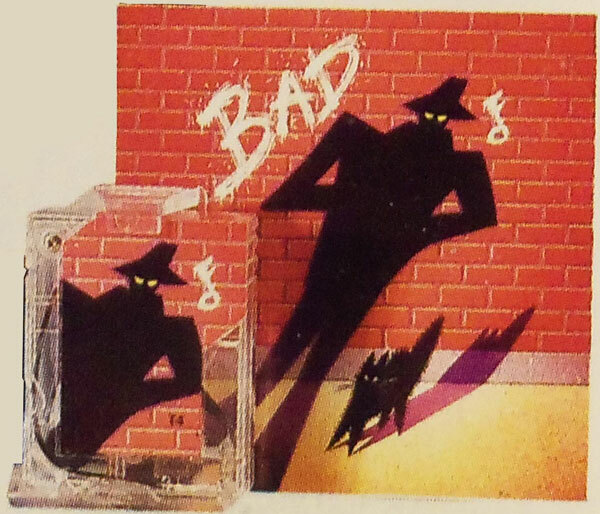 Title: Michael Jackson - "Bad'" & "Beat It"
Litho #1 - Michael Jackson wearing black leather, and the words "MICHAEL JACKSON" in black. 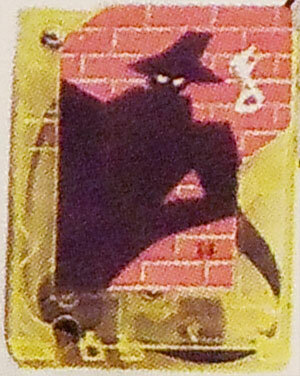 Litho #2 - Red brick wall with a black shadow of a villian with yellow eyes. 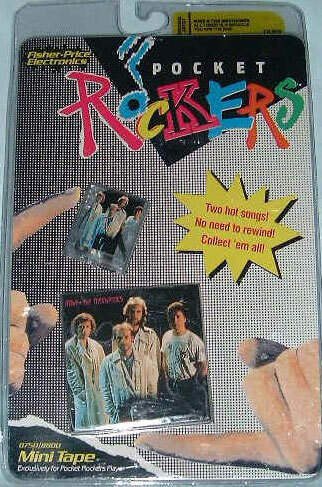 Title: The Jets - "Cross My Broken Heart" and "You Got It All"
Description: Pocket Rockers Mini-Cassette with a paper lithograph that has The Jets band members (8 people) standing on a staircase the song titles "Cross My Broken Heart" and "You Got It All". 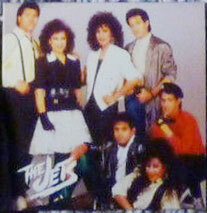 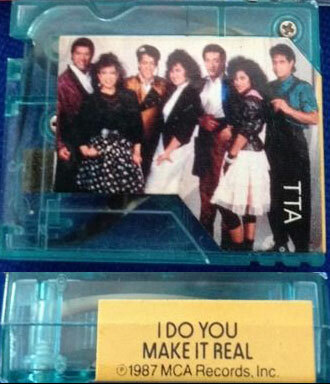 Title: The Jets - "I Do You" and "Make It Real"
Description: Pocket Rockers Mini-Cassette with a paper lithograph that has a picture of The Jets (7 band members) the song titles "I Do You" and "Make It Real". 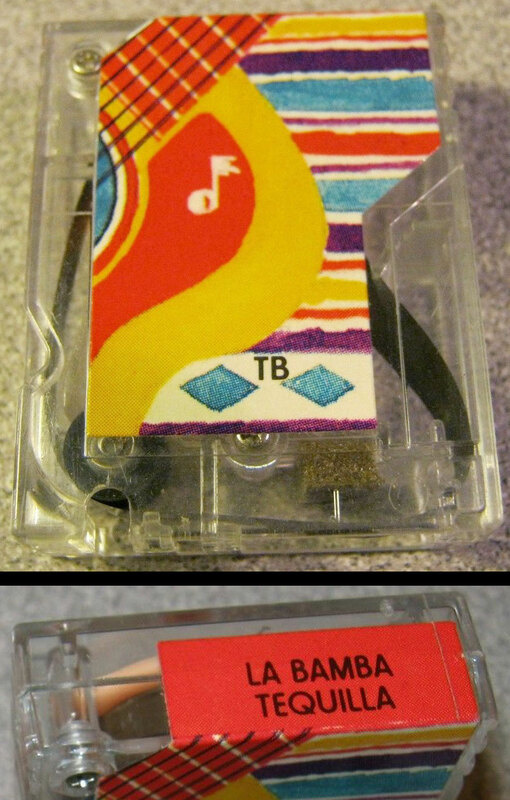 Title: Los Lobos - "La Bamba" & "Tequila"
Description: Pocket Rockers Mini-Cassette with a paper lithograph on the front of a red and yellow guitar and a red lithograph on the top marked "LA BAMBA" and "TEQUILA", which are the two songs recorded onto the tape. 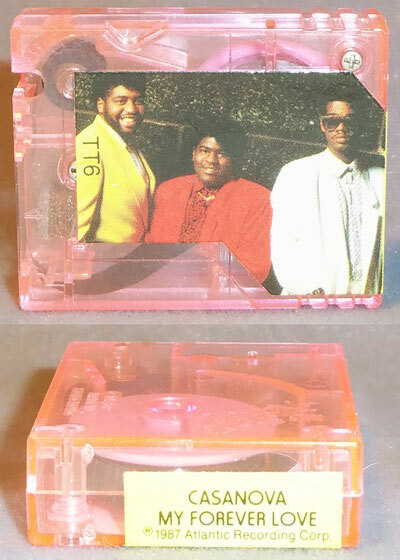 Title: Levert - "Casanova" and "My Forever Love"
Description: Pocket Rockers Mini-Cassette with a paper lithograph on the front of Levert (3 artists) top marked "CASANOVA" and "MY FOREVER LOVE". 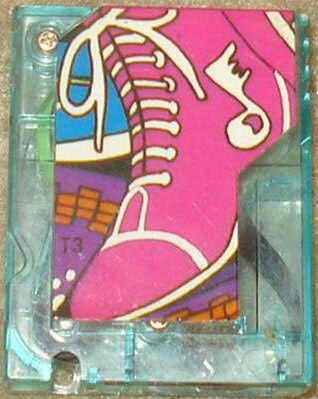 Title: Kenny Loggins - "Footloose" and "Danger Zone"
Description: Pocket Rockers Mini-Cassette with a paper lithograph on the front of a pink cartoon boot and top marked "Footloose" and "Danger Zone". 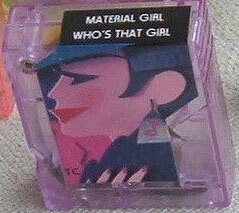 Title: Madonna - "Who's That Girl?" 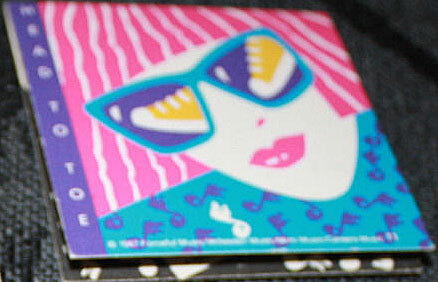 and "Material Girl"
Litho #2 - Abstract cartoon face of a woman with triangular hair and wearing sunglasses. 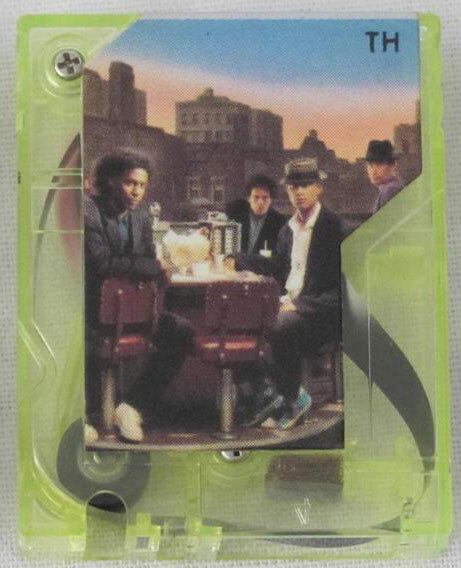 Title: Mike and The Mechanics - "All I Need"
Description: Pocket Rockers Mini-Cassette with a paper lithograph on the front of Mike and The Mechanics (4 band members) and the song titles "All I Need" on the top. 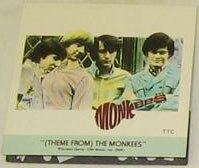 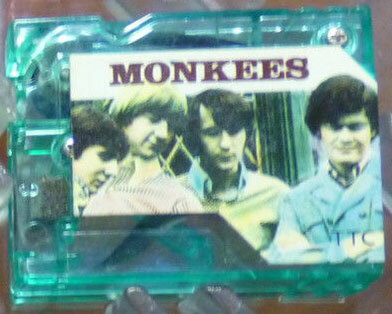 Title: Ray Parker Jr. "Ghostbusters" and The Monkees "Monkees Theme Song"
Description: Pocket Rockers Mini-Cassette with a paper lithograph that has a picture of the Monkees on the front and the song titles "Ghostbusters" and "Monkees Theme Song" on the top. 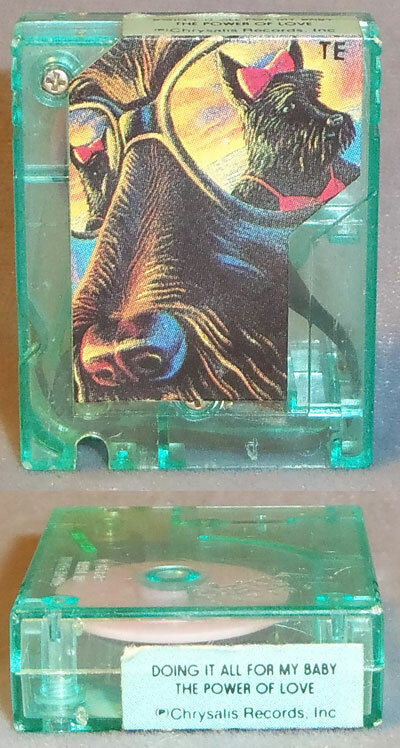 Title: Tom Petty - "Don't Come Here No More" and "Rock & Roll Star"
Description: Pocket Rockers Mini-Cassette with a paper lithograph that has a picture of an eye and nose on the front and the song titles "Don't Come Here No More" and "So You Wanna Be a Rock & Roll Star" on the top. 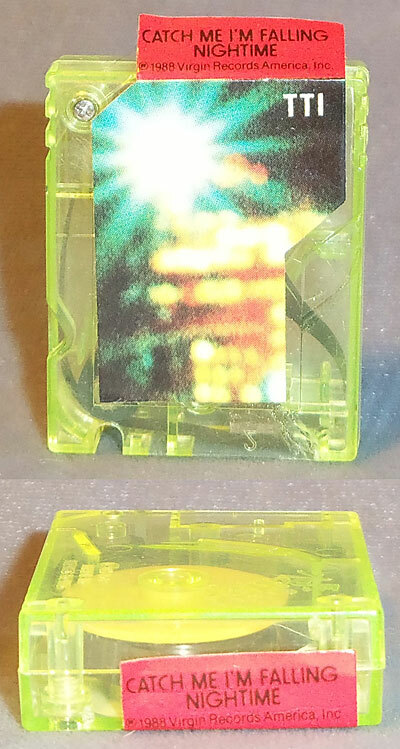 Title: Pretty Poison - "Catch Me I'm Falling" and "Nightime"
Description: Pocket Rockers Mini-Cassette with a paper lithograph that has a picture of blurred lights on the front and the song titles "Catch Me I'm Falling" and "Nightime" on the top. 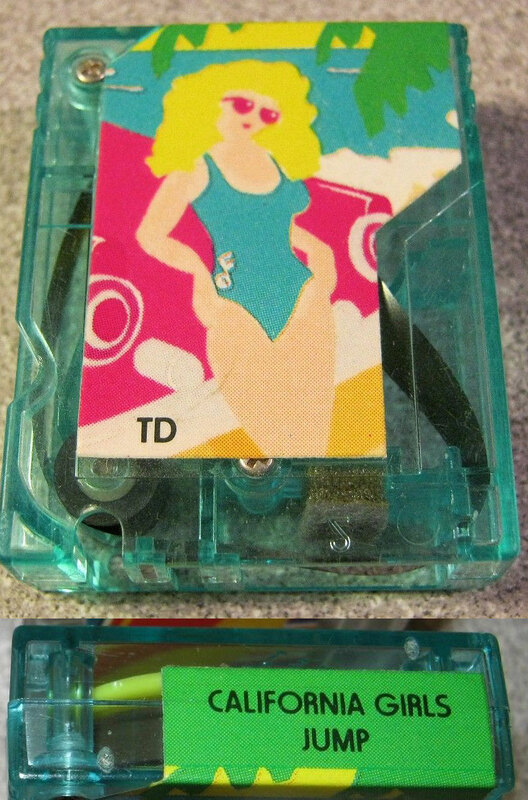 Title: David Lee Roth - "California Girls" & "Jump"
Description: Pocket Rockers Mini-Cassette with a paper lithograph that has a picture of a cartoon blond girl in a bathing suit and leaning against the end of a pink car on the front and the song titles "California Girls" and "Jump" on the top. 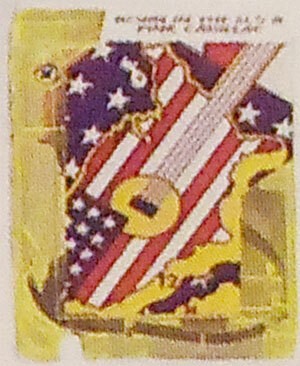 Title: Bruce Springsteen - "Born In The U.S.A." & ? 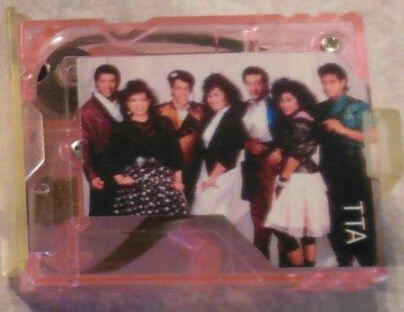 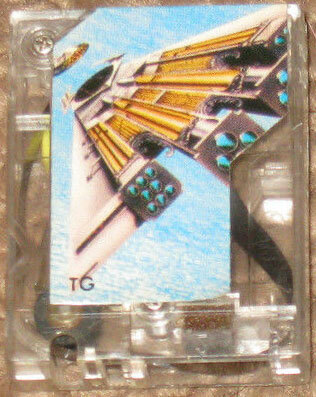 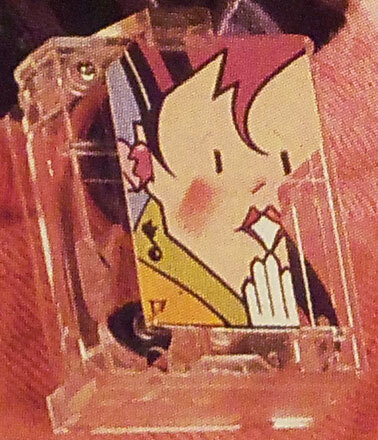 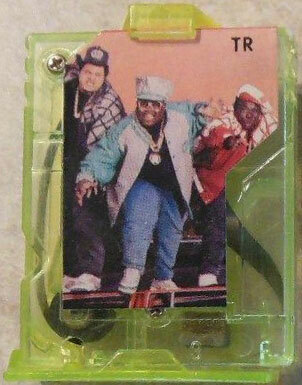 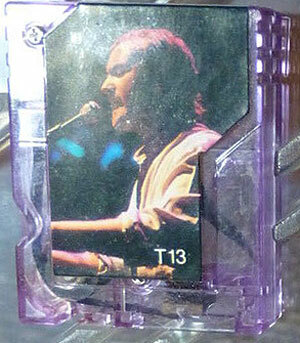 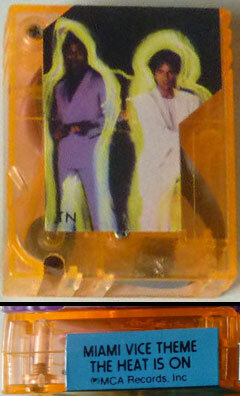 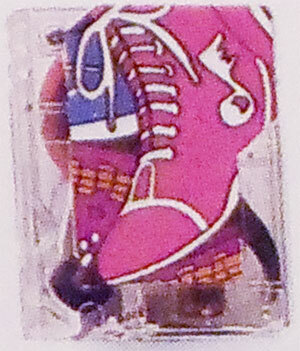 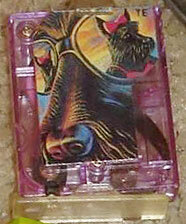 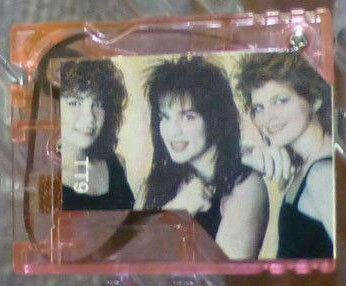 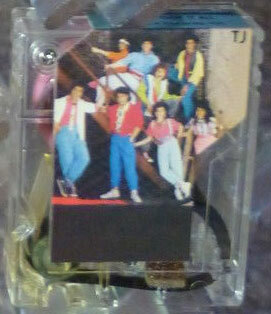 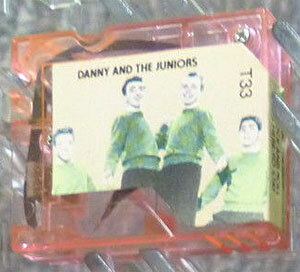 Description: Pocket Rockers Mini-Cassette with a paper lithograph that has a picture of ? 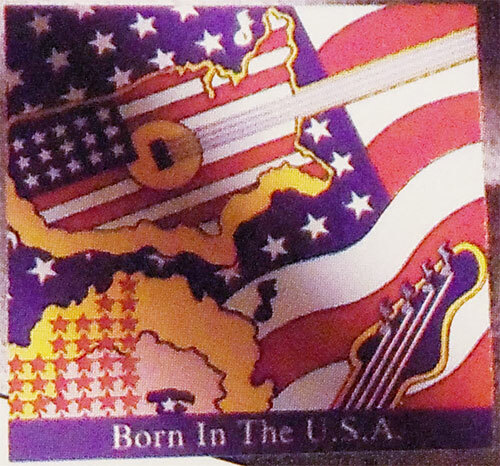 on the front and the song titles "Born In The U.S.A." and an unknown song on the top. 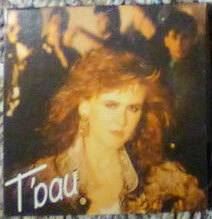 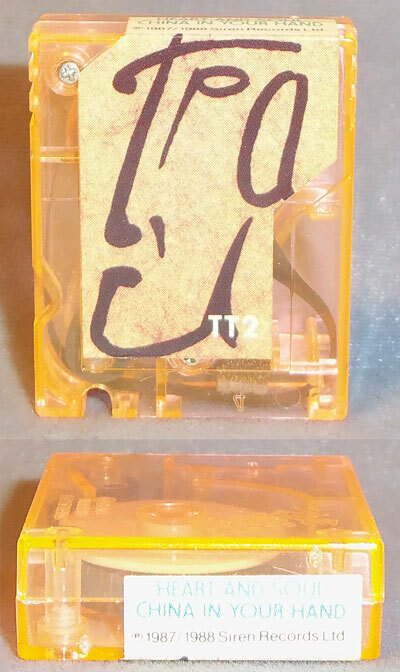 Title: T'Pau - "Heart And Soul" & "China In Your Hand"
Description: Pocket Rockers Mini-Cassette with a paper lithograph of a black outline cartoonish face (side profile) that has the song titles "Heart And Soul" and "China In Your Hand" by T'Pau on the top. 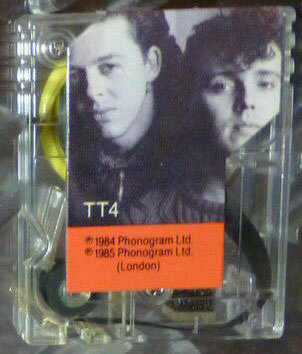 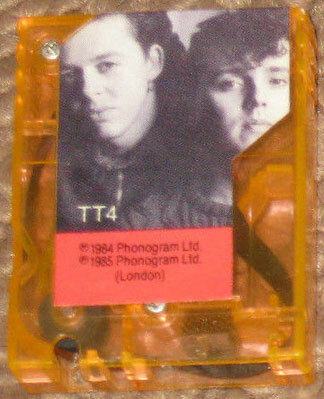 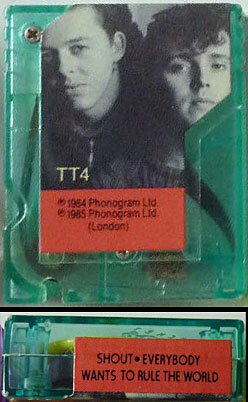 Title: Tears For Fears - "Shout" and "Everybody Wants to Rule The World"
Description: Pocket Rockers Mini-Cassette with a paper lithograph that has a picture of Tears for Fears (2 male artists) and the song titles "Shout" and "Everybody Wants to Rule The World". 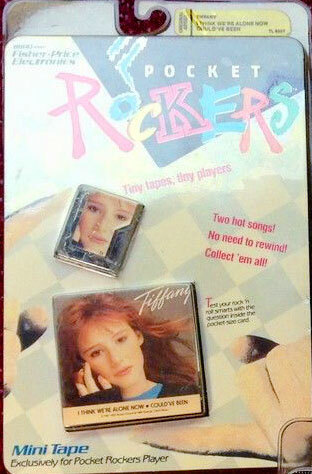 Title: Tiffany - "I Think We're Alone Now" and "Could've Been"
Description: Pocket Rockers Mini-Cassette with a paper lithograph that has a picture of Tiffany's face on the front and the song titles "I Think We're Alone Now" and "Could've Been" on the top. 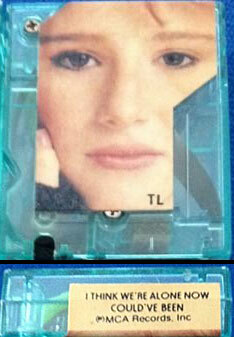 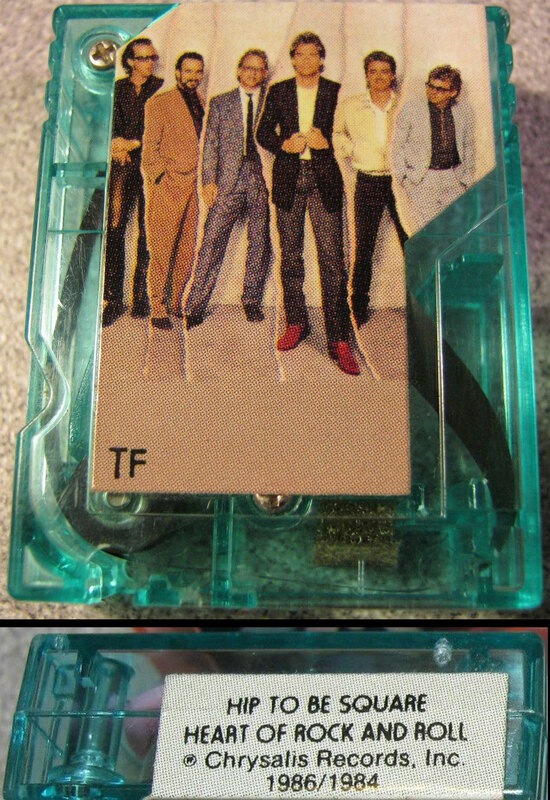 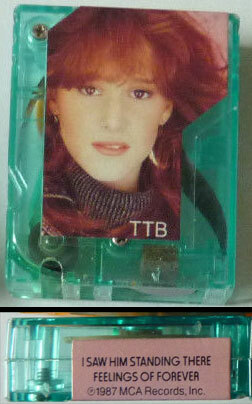 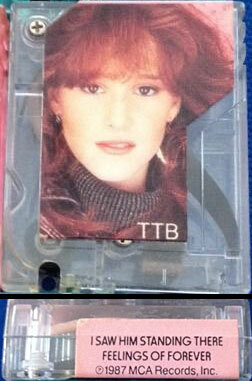 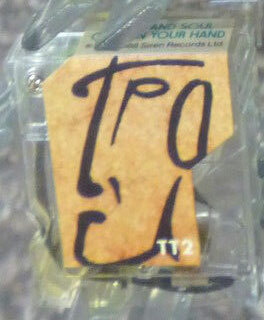 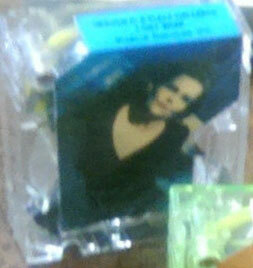 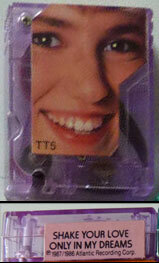 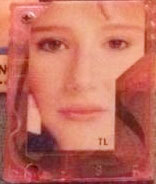 Title: Tiffany - "I Saw Him Standing There" and "Feelings of Forever"
Description: Pocket Rockers Mini-Cassette with a paper lithograph that has a picture of Tiffany's face (neck up to top of head) on the front and the song titles "I Saw Him Standing There" and "Feelings of Forever" on the top. 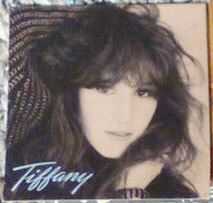 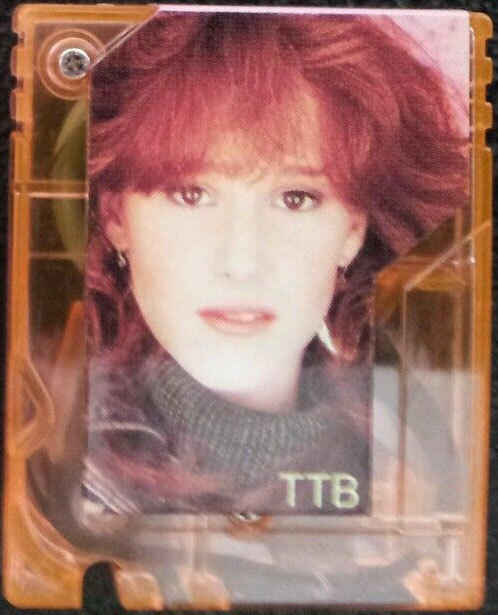 Title: Tiffany - "All This Time" and "Radio Romance"
Description: Pocket Rockers Mini-Cassette with a paper lithograph that has a picture of ? 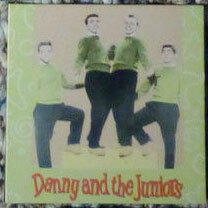 on the front and the song titles "All This Time" and "Radio Romance" on the top. 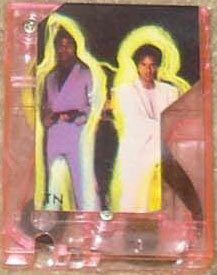 Title: Wham! 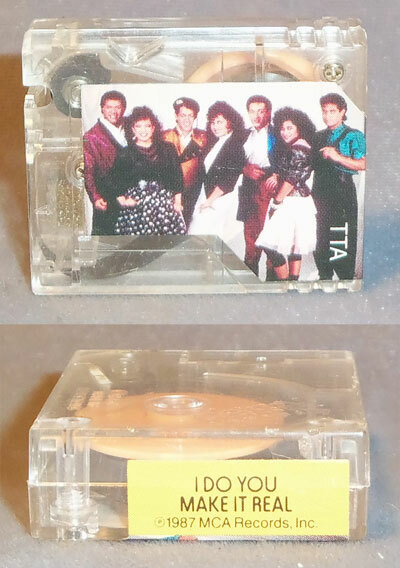 - "Wake Me Up Before You Go-Go" and ? 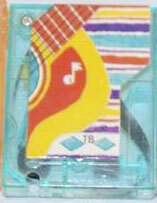 Description: Pocket Rockers Mini-Cassette with a paper lithograph that has a picture of ? 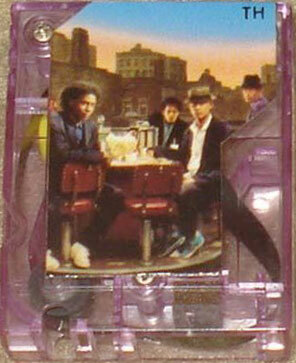 on the front and the song titles "Wake Me Up Before You Go-Go" and an unknown song on the top. 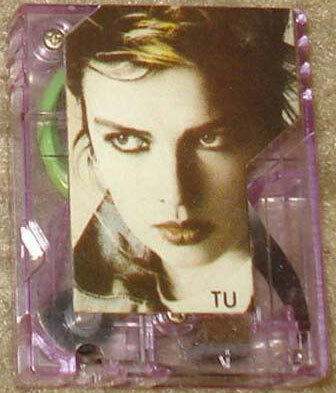 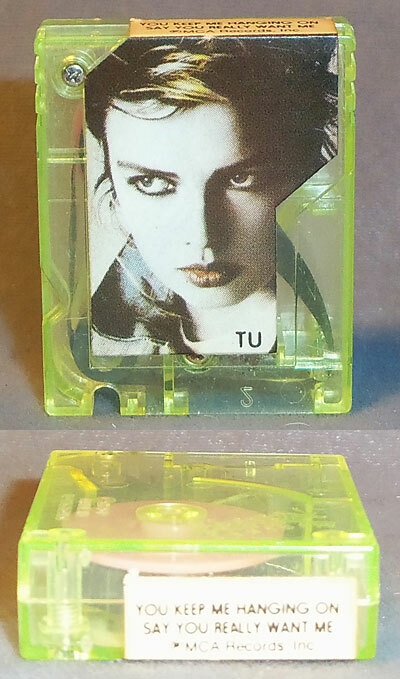 Title: Kim Wilde - "You Keep Me Hangin' On" and "Say You Really Want Me"
Description: Pocket Rockers Mini-Cassette with a paper lithograph that has a picture of Kim Wilde on the front and the song titles "You Keep Me Hangin' On" and "Say You Really Want Me" on the top.